Food trucks and food carts used to be about fast, cheap food that comes to you—watery coffee, soggy hot dogs, and cold pastries served up by people punching a time clock. But no more. Food trucks sell creative food made from quality ingredients and by people who are passionate about what they do. Social media has amped up the stakes—you have to be creative and engaging to compete with the guy on the next corner. And, unlike a restaurant, where the chef is hidden away in the kitchen hurling knives and serving up insults with each platter, at the food cart you’re up-close and personal with the person making your food, so grumpy cranks probably won’t make it. 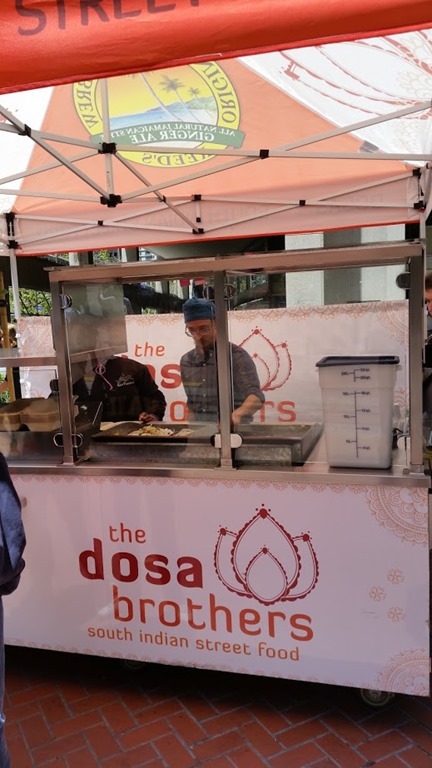 If you’re in San Francisco looking for food creativity and innovation for under $10, check out the Dosa Brother’s cart now at two locations—Market and Montgomery or California and Drumm. Dosas are a traditional Southern Indian dish consisting of a large, thin, crisp pancake made of a flour of fermented rice and lentils, wrapped around a small serving of vegetables and served with chutney and a lentil soup, called sambar. (There are many versions of this very adaptable recipe). 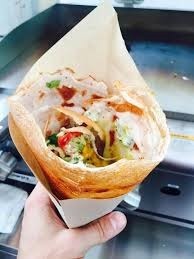 The Dosa Brothers have amped up the traditional recipe and turned this into a hand-held street food. The pancake has been downsized and the amount of filling substantially increased, a lentil sauce is folded into the filling replacing the sambar soup, and the filling is then topped with Awesome Sauce, a sour cream, cilantro, and jalapeno sauce that gives the dish plenty of moisture and earns its name. A serving of coconut chutney on the side gives the dish color. And if you get the cone-shaped dosa you can eat holding it in one hand while you play Words With Friends with the other. Choose between the Masala Dosa with a potato and pea curry, the Paneer Dosa filled with cheese, onion, ginger, peas and tomato, or a combination of the two (my favorite). A cabbage and herb mix is optional and several drinks fill out the menu including a lassi, chai, and several sodas. And you can order online to beat the crowds. Authentic? Nope. Better than authentic? Absolutely! Head DB Wahe Guru knows the difference having lived in India for many years. But time marches on and the history of the Dosa just took a big step forward.